Those voters who were in the queue in the polling booths at 5 pm, the official time for end of voting, would be able to exercise their franchise. An estimated 77.6 per cent voter turnout was recorded in the election to the West Tripura Lok Sabha seat on Thursday, Deputy Chief Electoral Officer Suman Rakshit said. The CPI(M) and Congress alleged rigging and intimidation of voters by the BJP, a charge denied by the saffron party. “Till 5 pm voting percentage was 77.6 per cent. The polling percentage may rise as data from all booths are yet to reach,” Rakshit told reporters. Those voters who were in the queue in the polling booths at 5 pm, the official time for end of voting, would be able to exercise their franchise, the official said. 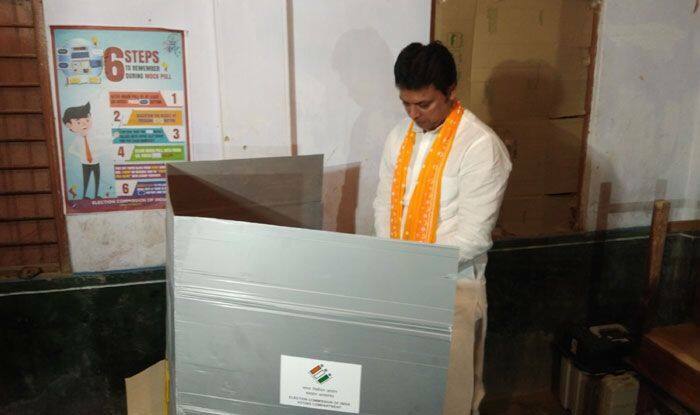 Tripura Chief Minister Biplab Kumar Deb, leader of the opposition Manik Sarkar, sitting MP and CPI-M candidate for the West Tripura constituency Shankar Prasad Datta, Congress candidate Subal Bhowmick and BJP candidate Pratima Bhowmick exercised their franchise in the morning. CPI-M general secretary, Sitaram Yechuri, who is in the state alleged that more than 460 booths out of the total 1679 were “rigged, voters were intimidated and forced to leave the booths and the agents of Left political parties were not allowed to enter inside the booths by the BJP workers”. “Central forces were not seen in the booths. They were entirely absent and it was possible due to collaboration of the Central and the state government. We have demanded repolling in 460 booths,” Yechuri told a press conference. Congress candidate Subal Bhowmick alleged that BJP workers “intimidated and threatened voters”. “We have demanded the immediate resignation of DGP, A K Shukla and Chief Electoral Officer (CEO), Sriram Taranikanti because police acted as silent spectators when booths were rigged before their eyes by BJP workers,” Bhowmick told a press conference. BJP candidate and general secretary of the Saffron party state unit, Pratima Bhowmick denied the allegations of the Congress and CPI-M.
Tripura Chief Minister Biplab Kumar Deb said people exercised their franchise in a “festive mood” and voting was “completely peaceful”. “People of the state will vote for the BJP with enthusiasm because they want to see Narendra Modi as the Prime Minister of the country and a strong nation,” he told reporters at Udaipur, about 60 km from here. Asked about incidents of violence or intimidation, DIG Arindam Nath said that “no major incident” has been reported so far.